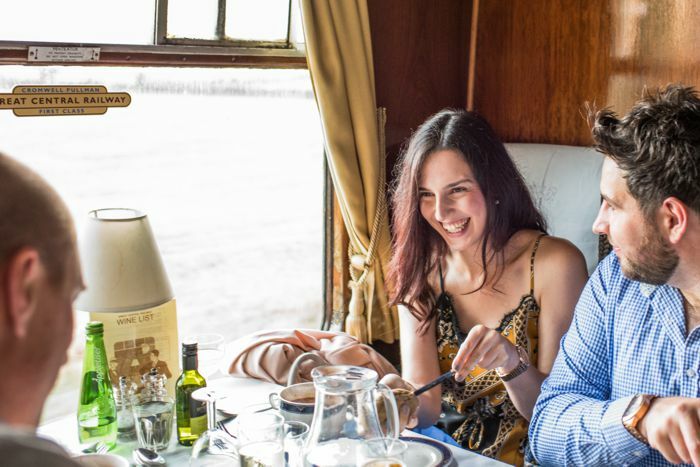 Sunday Luncheon 2019 - "The Elizabethan"
Your three-course lunch is served aboard our First Class Restaurant Cars as a steam locomotive takes you on a leisurely journey through Charnwood’s glorious countryside. Your meal is served during the journey and there will normally be a pause on Swithland viaduct with its magnificent views across the reservoir to Charnwood Forest. The train departs from Loughborough Central at 1.00 p.m, returning at approximately 2.45pm. Tickets are £46.00 per adult or £36.00 per child. The price includes the full cost of the train ticket. At weekends, rail travel is unlimited on the date of dining. 6th to 20th Jan, 3rd Feb to 24th March, 7th April to 26th May, 9th June, 23rd June to 29th September, and 13th Oct to 30th Nov.